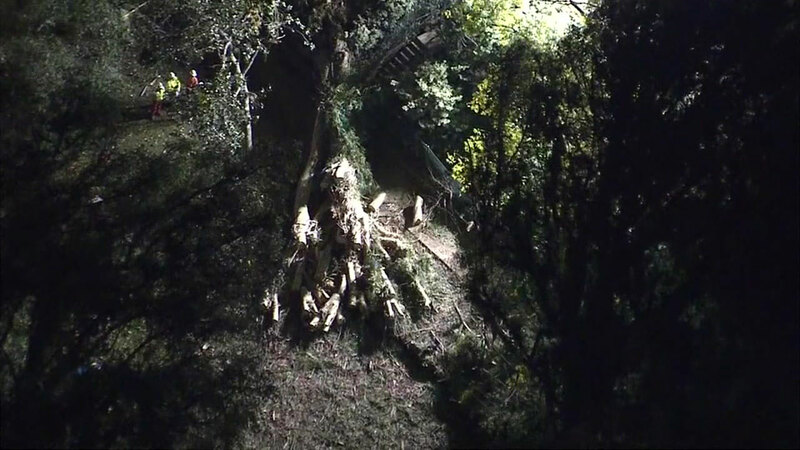 WHITTIER, CA -- A woman who was killed when a tree fell on a wedding party at a park in California over the weekend has been identified as the mother of the bride. The coroner's office identified the woman as 61-year-old Margerita Mojarro of San Pedro. A close friend of the family, who is also their neighbor, confirmed to Eyewitness News that Mojarro was the mother of the bride. The tree fell Saturday around 4:30 p.m. at Penn Park, killing Mojarro and critically injuring a 4-year-old girl, who suffered head trauma. The family friend said the little girl is the bride's niece. A wedding party was posing for photos under the tree when it suddenly uprooted and gave way, crashing down on the group below. Around 20 people were trapped under the tree's trunk and branches. In addition to the fatality and the injuries suffered by the little girl, at least four others were hurt as well. Penn Park remained closed on Monday morning as the investigation continues. Meantime, Whittier officials say they want answers. "We have a regular tree-maintenance program. We have a certified arborist on our staff that are managing our parks and our street trees, but at this point, we want to make sure we determine what caused this tree to go over," said Whittier City Manager Jeff Collier. A certified arborist is expected at the scene of the incident on Monday to look into what caused the tree to collapse and also check the structural integrity of the rest of the trees in the park to ensure safety before the park reopens.